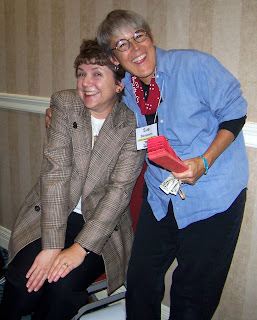 Late June, writers from all over the country met in Pasadena, CA, for the California Crime Writers Conference--a joint effort between the Southern California chapters of Sisters in Crime and Mystery Writers of America. Dozens of panels to choose from, high-quality speakers, and the comradere of fellow writers made the weekend worth every penny. In which way has the conference helped you the most - tangibly (facts, techniques, contacts) or intangibly (inspiration, support)? A good conference benefits the writer in many ways. You learn, you relearn, you’re invigorated, you’re humbled. You reconnect with old friends and meet new ones. That's all part of the appeal, whether you've just decided to begin writing, you're shopping your latest novel or any point in between. And, as has often happened to me, I found some of the most helpful information came from the least likely source. 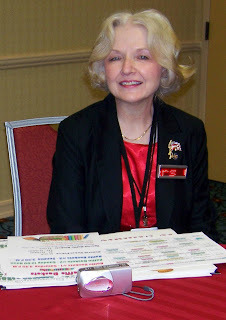 Note: The elusive Jackie Houchin takes many of the pictures for our blog. We will capture her on camera...eventually. I chose the “Learning the Craft” track because it fit what I am interested in. No, I haven't written any crime fiction since the junior detective series I wrote for my grandchildren ten years ago. But I do review mystery and thriller books, so I wanted to learn from the professionals what makes a terrific best-seller. 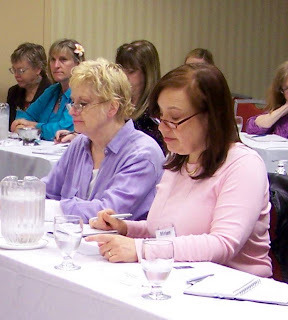 The tips I learned in these two sessions will help me better understand and review the next crime or suspense novel I read...if I can just remember to apply them. I have to say that the information she gave on marketing was the most valuable concrete information I received at the conference because she was talking about steps I can take today to get my "brand" out to people so they will be interested by the time my book comes out. Everyone inspired me in one way or another--the speakers with useful information, the other attendees with their stories and eternal optimism. I learned long ago that mystery writers are a close community, always willing to encourage and share tips. I highly recommend that writers get out of their cloistered writing rooms and step into this conference in two years when it is offered again. Got the IWOSC notice about your new group blog. Looks like your having fun. I look forward to checking in again.